Implantes inmediatos colocados post-exodoncia Reporte de un caso. Docente de Post-grado. Maestría en Periodoncia. Universidad de San Martín de Porres. Lima-Perú. Docente de Post Grado. Curso de Prótesis sobre implantes. Universidad de San Martín de Porres. Lima-Perú. Docente Coordinador. Maestría en Periodoncia. Universidad de San Martín de Porres. Lima-Perú. Aires I, Berger J. (2002) Immediate placement in extraction sites followed by immediate loading: A pilot study and case presentation. Implant Dent;11:87–94. Barone A, Rispoli L,Vozza I, Quaranta A, Covani U. (2002) Immediate restoration of single implants placed immediately after tooth extraction. J Periodontol;77:1914–1920. Belser U, Buser D, Higginbottom F. (2004) Consensus statements and recommended clinical procedures regarding esthetics in implant dentistry. Int J Oral MaxilloFac. Implants;19 Suppl:73-4. Sectional, Retrospective Study in 45 Patients With a 2-to 4- Year Follow-Up Using Pink and White Esthetic Scores. J Periodontol; 80: 140-151. Chen ST, Buser D. (2009) Clinical and esthetic outcomes of implants placed in postextraction sites. Int J Oral Maxillofac Implants;24:186-217. Esposito M, Grusovin MG, Polyzos IP, Felice P, Worthington HV. (2010) Interventions for replacing missing teeth: dental implants in fresh extraction sockets (immediate, immediate-delayed and delayed implants). Cochrane Database Syst Rev; (9):CD005968. Hämmerle CH, Stone P, Jung RE, Kapos T, Brodala N. (2009) Consensus statements and recommended clinical procedures regarding computer-assisted implant dentistry. Int J Oral Maxillofac Implants;24 Suppl:126-31. Hui E, Chow J, Li D, Liu J,Wat P, Law H. (2001) Immediate provisional for single-tooth implant replacement with Brånemark system: Preliminary report.Clin Implant Dent Relat Res;3:79–86. Morton D, Jaffin R, Weber HP. (2004) Immediate restoration and loading of dental implants: clinical considerations and protocols Int J Oral Maxillofac Implants;19 Suppl:103-8. Tepret F, Sertgöz A, Basa S. (2005) Immediately loaded anterior single-tooth implants:Two cases. Implant Dent;3:242–247. REYES DOIMI, Juan Domingo et al. Implantes inmediatos colocados post-exodoncia Reporte de un caso.. Actas Odontológicas (Publicación discontinuada), [S.l. ], v. 9, n. 1, p. 18-24, mar. 2016. ISSN 2393-6304. 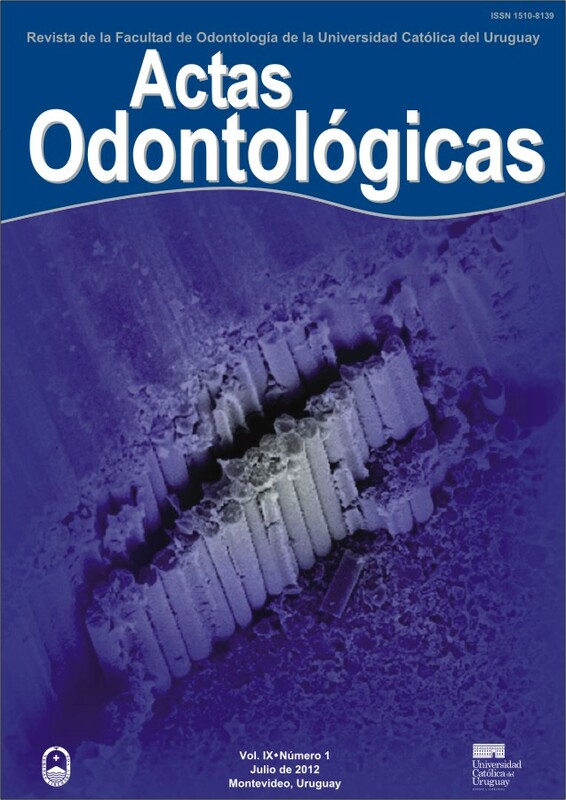 Disponible en: <http://revistas.ucu.edu.uy/index.php/actasodontologicas/article/view/975>. Fecha de acceso: 19 apr. 2019 doi: https://doi.org/10.22235/ao.v9i1.975.